We have been working hard to ensure we have licensed wireless communication channels as the backbone to our wireless network for Darrington Internet Users Association. Given we want the highest quality connection for our members leveraging a licensed microwave band will ensure that our signals are protected by the FCC. If we end up with interference along our long back haul down the valley we can engage the FCC who will take swift action to those causing the issue. This is the responsible way to ensure we can provide the best service possible. It also has its challenges. Part of the coordination efforts offered via professional FCC license coordinators is detailed in depth link studies to ensure that the proposed wireless links which DIUA would use will actually work. We submitted our proposals to the coordinator and they have come back that our original proposal would not work. 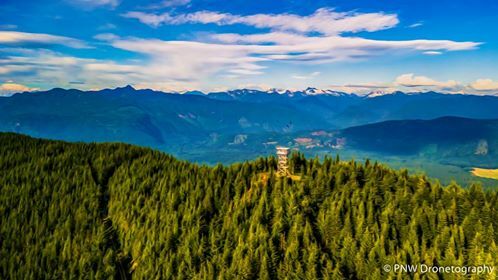 There is a small section just west of Darrington where trees would impact our signal significantly reducing our service stability and quality. The pros and the cons of living with lots of nature around! So we had to come up with alternative proposals. Our new proposed path brings us to Darrington via the tower on Gold Hill. This means that we’ll need to add more links to get from Gold Hill to the Darrington fire station. This also means that we’ll need quite a bit more equipment which means that our initial install costs will be higher than we first had hoped. This might sound like it is all doom and gloom here, but there is a bright side to this. We had planned to expand to Gold Hill as part of what we had coined our “Phase 2” investments. Those investments would provide coverage and services to those home who could see the tower on Gold Hill both North towards Sauk-Suiattle and West towards Oso. Since we now planning to include Gold Hill as part of our Phase 1 investments, this means we’ll be able to provide coverage to those areas from day 1. That’s right, we’ll be able to provide internet service to those folks with clear line of sight to the Gold Hill towers shortly after we get all of our equipment installed as a direct result of attempting to get licensed and reliable microwave bandwidth. Another side effect of the FCC coordination efforts was that they identified that our original plan was using equipment which just wasn’t big enough to get a reliable signal down the valley. The move from 2’ to 4’ dishes significantly increased the projected costs using Ubiquiti equipment as our back haul radios for 11Ghz. As a matter of fact the costs were so close that Cambium equipment became price competitive. Cambium equipment for the 11Ghz back haul has the advantage of only requiring 2 dish per pair of radios rather that Ubiquiti’s 2 dishes per pair of radios. This cuts down on many other logistical issues related to hosting gear on towers. Less antennas on the tower, less wind load. Less antennas on the tower, less equipment to aim and less time and money spent on certified people to aim them. Given those advantages with support of the DIUA board we have decided to move to Cambium PTP820S radios for our 11Ghz back haul. We will still be using plenty of Ubiquiti gear when it comes to connecting members to the network so those plans have not changed, we’re just able to put in higher quality radios for our main signal down the valley. These changes in addition to the recent leadership changes have pushed our availability schedule out beyond the end of 2018. We’re not ready to commit to any specific dates as to when service might be available yet but the DIUA Board and myself are working very hard to ensure we bring Reliable, Affordable and Fast Internet service to Darrington and surrounding areas. We will keep the news feed and members updated of our progress as we go along. Sorry for the long winded new posting but I felt it was important to get this update out there. For those of you interested in our new Phase 1 coverage options we have provided a Google Earth KMZ file as well as the image of the coverage map below.